Please note: A full resume for both Pat and Pam and little sister Darci are on the bottom of this page if you are interested in our credentials and our background. We strongly urge anyone that is purchasing a horse to check people out and make sure they have the training, and background to match you with a horse partner! Tonkawood Farm originated 35 years ago in Long Lake, Minnesota by Pat and Bill Dickey. Originally a professional stable for American Saddle Horses, the Farm expanded into Hunter-Jumpers and a children’s riding and training center. We also had a children’s day camp called Tonkawood, which specialized in young riders. Our goals were to properly train young riders in the skills of horsemanship and the good stewardship that accompanies the responsibility of animal ownership. Pat Dickey has ridden and owned horses since she was six years old. When she married, her father observed to her husband Bill, “you get her and the horse, but don’t worry, she’ll grow out of it!” Bill finally gave in to the inevitable and joined forces to be the support, driver, stable help on occasion, and general all round horse Dad for both daughters Pam and Darci. He was the support for Pat who showed for 15 years. Pat specialized in 5-gaited American Saddlebred competition, Darci, youngest daughter in equitation, and Pam in equitation, and pleasure. Tonkawood Farm was started at the farm in Long Lake, and served up to 60 horses on a regular basis. Pat taught children and adults for 25 years the art of horsemanship and her riders competed nationally. Here is Pat showing her Five Gaited American Saddlebred in competition. Pam started showing her first horse when she was four. She competed in many Tri-State shows and championships, and all phases of Saddlebred competition for 15 years. She then became enamored with the Hunter-Jumper world and eventually switched her allegiance. She has competed in many major events. Now as we become “Texans” Pam has taken up riding western pleasure horses and is competing in many shows. She loves the western pleasure, trail classes and English pleasure. Pam started riding before she “was” and has had a deep commitment and love for horses from birth. Pam actually was practically born on a horse. Her communication with the animal, her desire to see to its’ well-being and future is essential in the sales and work she does with the horses. She has that special eye for a horse that is truly unique in the horse world. Darci is now helping us with the “bomb” proofing and preparation of our horses. Her bibliography is featured on the bottom of this page. In the spring of 1994, the family sold their land in Minnesota and moved the Farm to the Hill Country of Texas, where they fell in love with the charm, history, beauty, the wonderful people, and the weather of the area. The operation has been scaled down to a little TONKAWOOD FARM that now specializes in selling children’s and amateur horses. When we came here to Texas we determined that there was a need for a business that specialized in matching horses to riders for the safety and well being of both. We heard so many horror stories of mismatched partners, (horse and human) that we decided to go back into the business on a smaller scale to provide a service that seemed to be needed. As the love for the Texas Hill country grew, Pat started trail riding in the beautiful local parks. She came to learn the importance of the trail horse. Safety, a good mind, clear head and over all soundness became an important criteria for specialization in the trail horses. Many call us and tell us that they just want a trail horse, nothing fancy. It has been Pat’s observation that the trail horse is the backbone of the horse industry and the hardest to find. It is one thing to ride in a ring, but quite another to be out in the hills, rocks, roads and scary things horses find. These horses must stand while tied to a trailer, load up easily, be safe, and comfortable to ride. You must be able to trust that horse to take care of you and USE IT’S HEAD!! These animals are worth their weight in gold and we believe the hardest to find! When Pat and Pam decided that the trail horse is a particular horses’ specialty, we take extreme care to test that horse for trail purposes. We purchase our horses based on their disposition first. All our horses must meet very strict criteria of good manners, safety and gentleness. After we evaluate the horse’s abilities, we determine what the proper “job” is for our horses. Pam evaluates and screens all the Tonkawood horses and determines their “calling”. She also checks the safety and suitability of the trail horses. Her job is to communicate with the horses and determine if they fit our strict criteria. She and Pat then determine when and IF a horse is offered for sale. The horses that go on the web site, are deemed ready for their new owners. The question of where we find our horses comes up. We have partnered up with a woman that comes from Colorado. She was raised on a working cattle ranch and knows horses well. Her father is a rancher and knows many of the ranching families throughout the states. The horses that are sold from these big ranches are the prime candidates for Tonkawood. We love the ranch horses as by the time they have done their work, and proven themselves sound, they make wonderful trail horses and teachers. The ranchers sell the horses when they reach a age of 8 and up. They like to keep their young stock working so we are able to purchase the “campaigners”. Anytime she is able to find the good ones they are brought to Tonkawood for review and purchase. The horses are put up on the web by Pat now as our grandson/son/nephew and our web master is now married, and lives inRichardson Texas and has two children ages 5 and 2. Both come and ride at the “ranch”. Time flys and joy abounds. The Tonkawood horses are not offered for sale until they have been thoroughly checked, properly shod, coggins tests, and ready to go to a “new home”. It is very important to us that our horses have the right home. WE BELIEVE THAT THE HORSE AND RIDER ARE A SPECIAL PARTNERSHIP. Drawing on 35 years’ of experience in all phases of the horse business, TONKAWOOD knows how to match the horse with the rider. Pam rode and showed horses since she was 6 years old. She competed for 10 years in the American Saddle Horse Association shows. She showed and won in the United Professional Horseman’s Association classes for 10 years. She started teaching riding when she was 14 years old and taught until 1996. She then switched to the Hunter Jumper world. She belonged to the Minnesota Hunter Jumper Association and the Texas Hunter Jumper Association. She also was a member of the Central Texas Hunter Jumper Association. She trained and sold Hunters for the first 7 years in Texas upon arriving in Texas in 1994. She was recipient of the prestigious Association Medal class for her skill and riding ability in 2001. Pam became interested in the American Quarter Horse Association and the American Paint Horse Association shows in which she is a present member. She is also a member of Alamo Area Youth Horse Association. She has competed for three years in the all around events for Western riding, and English equitation, pleasure, and discipline rail classes. She has won many awards including blues at the San Antonio Stock show in 2004 and 2005. She is now involved with sorting competition and is enjoying that sport along with her western pleasure showing. She has worked for Tonkawood Farm Inc .as head sales associate, and is responsible for evaluation and suitability of the horses Tonkawood offers for sale since our arrival in Texas in 1994. Pam along with her mother, Pat Dickey also is an officer in Common Ground Foundation that rescues and rehabilitates horses and works with at risk children. New alert! Pam has now started giving lessons. Many have asked her to teach as her wealth of experience lends itself to sharing that information to help folks be better horse people. We are now offering a service that Pam will teach and evaluate a rider for the best horse we can provide and THEN give lessons on said horse before the horse is taken home. This protocol is working well as it gives our customers time to evaluate, get to know their new partner and ask questions before they launch out on there own. She is also offering lessons on our good lesson horses to children and adults that do not own horses. Please call the ranch for more information. Pat Dickey has been actively involved in the horse business since 1957 at which time she was a senior in high school. She has owned horses consistently since she was 6 years old. She began her professional career as a senior in high school in 1957 as an instructor of horsemanship at Camp Adventure in Prior Lake Minnesota for two years. She was responsible for 16 horses and 100 children. 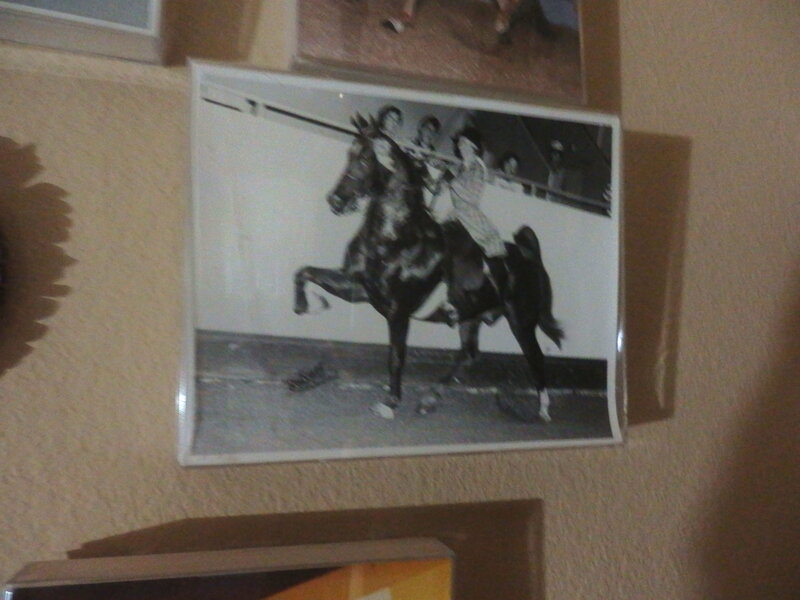 She then started her own horsemanship camp, Camp Tonkawood in 1960 to 1973. This camp was a children’s day camp that featured horseback riding as its major activity. The camp went on to be the largest children’s day camp in the state of Minnesota. She averaged 125 children with 25 riding horses in her lesson program. In 1973 she started Tonkawood Farm, a professional training facility that showed and trained American Saddle Bred horses under the training of Frank Thomas a world champion recipient in the American Saddle Bred world. She was responsible for all the activities of the stable, owner and taught riding for those years. Pat taught and coached her two daughters Pam and Darcy to numerous championships on the tough Tri State circuit located in the Midwest area for 10 years. Pat showed and trained her 5 gaited American Saddle Bred horses. She was a member of the Minnesota Tri State Association; winner of the High Point Awards for 5 gaited riding and won the prestigious Minnesota State Fair Ladies 5 gaited championship in 1978. She was founder and President of the Minnesota Saddle Horse Association, and the founder of the Minnesota Saddle Horse Breeders Association’s futurity. She was awarded the prestigious award for dedication and contribution to the horse industry by the Minnesota Saddle Bred Association in 1985. After her show career, Pat continued to teach riding, and ride herself for pleasure. When the showing world activities ceased, Tonkawood Farm became a boarding and schooling facility for riding. 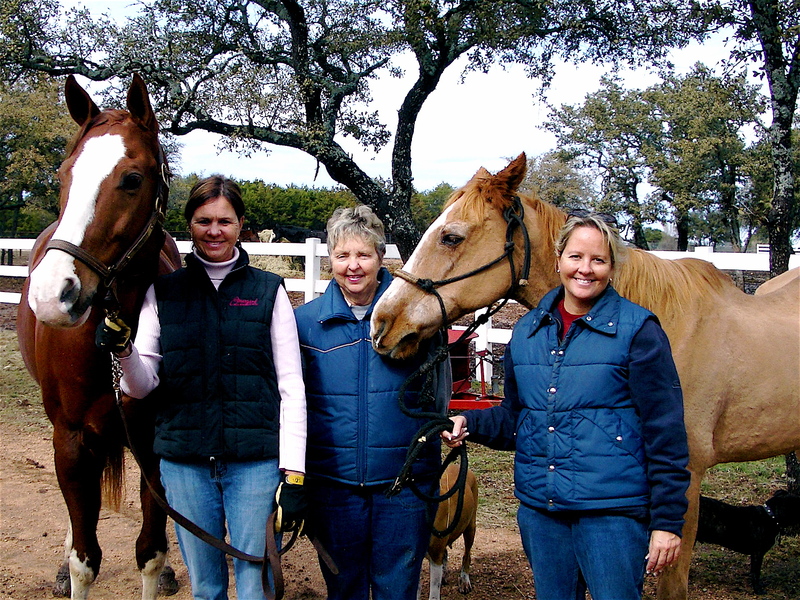 Pat taught riding and her daughter Pam became involved in the Hunter Jumper world until the move to Texas in 1994. Upon the move to Texas, in 1994, a smaller version of Tonkawood Farm was undertaken in the Marble Falls area. Pat is an active rider at this time, and rides trails in the Texas Hill Country on a regular basis. Pat owns and rides three horses of her own and Pam has her show horse Cowboy that she is now giving lessons on.. Pat is responsible for all web work, bookkeeping, policy making and general business part of Tonkawood Farm Inc. She also is the fine “eye” to help determine suitability and proper placement with our horses. Darci is helping us “bomb” proof horses. Darci started riding when she was 4 years old. She started showing when she was 8 and showed American Saddle breds and English equitation. Darci showed and competed until she was 19 years old. She went undefeated for 3 years standing on her wonderful 3 gaited horse, Gussie Gay. After the family moved to Texas, Darci started her dream of owning her own restaurant. Darci’s Deli was a landmark in Marble Falls for 6 years. After the birth of her son, Mikey, she went to work for the Horseshow Bay corp. as a manager as the hours of ownership did not allow “Mom” time. She has now opened her Deli again, as Mikey is old enough and in school. Darci’s busy business, Darci’s Deli at 611 3rd street, in Marble Falls is thriving. When possible, Darci helps Pam ride and prepare our horses for sale. .